Since 1994, evidence concerning the time of divergence between primates and other orders of placental mammals, which conflicts with a direct reading of the known fossil record, has been steadily accumulating from several independent studies of DNA sequence data. In a comparative analysis of the marsupial Didelphis virginiana and several placentals, taking sequence data for 8 mitochondrial genes with rates of evolution not significantly differing from a molecular clock model, a calibration date of 130 MYA for the marsu-pial/placental divergence yielded a date of 93 ± 2 MYA for the divergence between human (representing primates) and a group representing carnivores, artiodactyls, and cetaceans (ferungulates) (Janke et al., 1994). Subsequently, using sequence information for a large sample of nuclear genes showing relatively constant rates of change in mammals and birds, and taking a calibration date of 310 MYA for the separation between diapsid and synapsid reptiles, divergence times between primates and artiodactyls and between primates and rodents were both estimated to be around 90 MYA or older (Hedges et al., 1996). In a follow-up study based on a larger sample of species and nuclear gene sequences, it was found that inferred molecular dates calibrated in this way agree with most early (Paleozoic) and late (Cenozoic) paleonto-logical dates, but that major gaps are apparent in the Mesozoic fossil record. It was inferred that at least five lineages of placental mammals arose more than 100 MYA and that most modern orders diverged before the end of the Cretaceous (Kumar and Hedges, 1998). On a separate tack, combined analysis of DNA sequences from three mitochondrial genes and two nuclear genes indicated that adaptive radiation from a specific common ancestor gave rise to a group of African mammals containing golden moles, hyraxes, manatees, elephants, elephant shrews, and aardvarks ("Afrotheria"). Using nine different calibration points within the mammalian tree (including a date of 130 MY for the marsupial/eutherian split and a date of 60 MY for the ruminant/cetacean split), the mean divergence time between Afrotheria and other orders of mammals (including primates) was estimated at about 90 MYA (Springer et al., 1997). In yet another approach, sequence data for the complete cytochrome b gene were used to generate a tree showing divergences between various mammal species, including 10 primates, and the tree was calibrated by taking a date of 60 MYA for the split between artiodactyls and cetaceans. 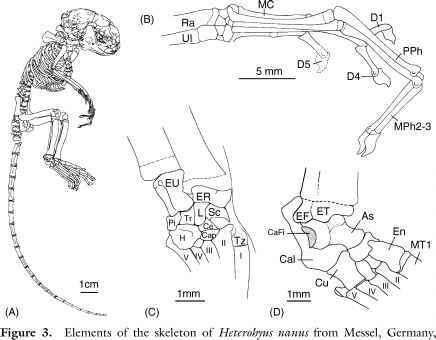 This calibration indicated that primates diverged from other orders of mammals at about 90 MYA and that the split between haplorhine and strepsirrhine primates took place about 80 MYA (Arnason et al., 1996). The data set was subsequently expanded to include new sequence data for the baboon, and a double calibration based on the fossil record for ungulates was applied: 60 MY for the divergence between artiodactyls and cetaceans and 50 MY for the divergence between equids and rhinocerotids among perissodactyls. The time of divergence between ungulates and primates was estimated at 95 MYA, while the split between strepsirrhines and haplorhines was confirmed to be in the region of 80 MYA (Arnason et al., 1998). These studies consistently indicate that primates diverged from other placental mammals about 90 MYA. Xenarthra, Laurasiatheria, and Euarchontoglires, the latter including Primates). Afrotheria was the first of these groupings to diverge, at an estimated date of 103 MYA, while the divergence between Laurasiatheria and Euarchontoglires was estimated at 79-88 MYA. It should be noted that all of the molecular trees cited were calibrated using the ages of various known fossil representatives of lineages external to the order Primates. Given that first recorded fossil representatives must in all cases indicate minimum dates for times of divergence, it is striking that a relatively consistent result emerges with respect to inference of the time of divergence of primates. (This is perhaps because comparatively well-documented parts of the mammalian tree were selected as sources of calibration dates). It should also be emphasized that the primary concern in calibration of molecular trees to date has been the time of divergence of primates from other orders of pla-cental mammals (node 1 in Figure 1). There has been relatively little interest in dating the last common ancestor of living primates (node 3 in Figure 1), although genetic distances uniformly indicate that the temporal gap between the initial divergence of primates and their common ancestor must have been relatively small.